If you have more than one panel or battery, please scroll down to sections on arrays and banks before commencing installation. Step 1: Decide where you want to install the panels (ideally, within 5m of the charge controller) and which type of brackets you are going to use. The easiest is to mount the panels flat on the roof of your motorhome. Step 2: Once you know where you want the panels to go, mark out the position on the roof. The easiest way to do this is to mark out the outline of the panel(s) and very carefully mark where any predrilled bracket holes are. Step 3: When this is done, position the brackets. When you are completely satisfied with their placement, you are ready to start bonding. Step 4: Wherever you will use a bonding agent, it is important to ensure that surfaces are grease and dust free, so both the brackets and the roof need to be wiped down with a cleaning (primer) agent or detergent solution and allowed to dry. Step 5: Using your pre-drawn outline of the panels, carefully place the brackets in the correct position, trying to build in a few millimeters extra so that you have a little margin for error and can easily position the panels later. If you’re using Sikaflex as your fixing agent, BE VERY CAREFUL at this stage, because once the agent has set, you CANNOT move them later – it might be a good idea to check that the panels fit and any bracket holes align before everything has cured completely. Step 6: Once the brackets are in place, install the cable gland. The cable gland creates a waterproof seal where the cable(s) pass through the roof. Simply drill through the roof where you want the cable to enter and fix the gland over the hole, using a bonding agent, so that the hole is under the sloped side of the gland. Ideally, the charge controller should be within 5m of the panels and within a metre or two of the batteries. The basic rule of thumb is that the shorter the cable the better, as it will reduce any voltage losses and result in a more efficient system. Step 1: Fix your charge controller in its position. Step 2: Feed the solar panel cable to where the controller is and strip 1-2 inches off the end, and strip 10mm from the internal cable to show the copper core (this should be twisted). DO NOT connect the panels to the controller at this stage. Step 1: Place your battery in position. Step 2: Connect a correctly sized cable to the controller battery output. Some people choose to install a fuse to the cable or a blocking diode to prevent overnight discharge, but with most modern controllers, this is not entirely necessary. Step 3: Connect inverter to battery terminals, NEVER connect an inverter to a charge controller. The controller’s load output is limited by its current rating (A) and inverters often draw very high currents (e.g. 5-amps drawn on the 240V side becomes 100A at the 12V side). Step 1: If you didn’t lay the panels face down earlier, make sure the panels are face down or covered so that they are not exposed to the sun and are not producing a voltage. Step 2: Connect the solar panels to the charge controller. Step 3: Turn the panels face up or uncover them. The charge controller may go through a test phase and then show a green status indicator. Step 1: Check that any wiring you are connecting is 12v and does not come from a preinstalled inverter. Step 2: Connect any 12v wiring to the load output on the charge controller. Once you are happy with how everything is working, you should now fix the panels in place on their brackets. Option 1: Normally self-tapping screws are supplied in the bonding kit or bracket set, so you only need to drill 2-3mm holes through the side of the metal frame of the panel. Option 2: If using aluminium panel mounting frames, the frame should be supplied with nuts and bolts for attaching the panel using the pre-drilled mounting holes on the underside of the panel’s aluminium frame. Option 3: Some people choose to use Sikaflex to fit the panels into their frames, which is a permanent solution, with the added benefit that the panels are very difficult (almost impossible) to remove and steal, but the downside of being extremely difficult to remove if you were to want to make changes in the future. So, there we have it … your solar panel system is installed, set up and running, so you are now producing electricity from the sun! The diagram above shows 2 x 17 Volt 30 Watt Solar Panels connected in parallel each with a maximum current of 1.76A. Connecting the two solar panels together in parallel keeps the voltage the same, but doubles the wattage and current. The diagram above shows 2 x 17 Volt 30 Watt Solar Panels connected in series each with a maximum current of 1.76A. Connecting two solar panels in series will double the voltage and wattage, but the current will stay the same. For a 12v system, you will need to connect in parallel. When connected in parallel the capacity of the batteries is added together. When connected in series the capacity stays the same, but the voltage doubles. 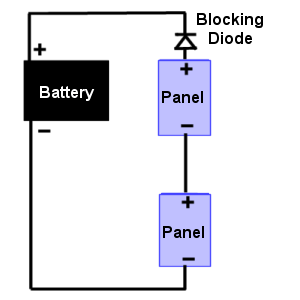 The diagram above shows a simple setup with two panels charging a battery (for simplicity no controller is shown) with a blocking diode in series with the two panels, which are also wired in series. When the sun shines, as long as the voltage produced by the two panels is greater than that of the battery, charging will take place. 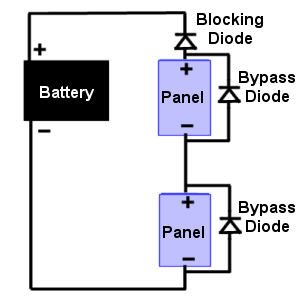 However, in the dark, when no voltage is being produced by the panels, the voltage of the battery would cause a current to flow in the opposite direction through the panels, discharging the battery, if it was not for the blocking diode in the circuit. Blocking diodes will be of benefit in any system using solar panels to charge a battery. Blocking diodes are usually included in the construction of solar panels so further blocking diodes are not required. Now let’s consider what happens if one of the panels in the above diagram is shaded. Not only will that panel not be producing any significant power, but it will also have a high resistance, blocking the flow of power produced by the unshaded panel. This is where by-pass diodes come into play as shown in the diagram above. Now, if one panel is shaded, the current produced by the unshaded panel can flow through a by-pass diode to avoid the high resistance of the shaded panel. By-pass diodes will not be of use unless panels are connected in series to produce a higher voltage. They are most likely to be of benefit where an MPPT Controller or String Inverter involves panels connected in series to produce voltages well above that item’s minimum input voltage. Some solar panels are constructed with the cells divided into groups, each group having a built-in by-pass diode. Shading of part of a panel may be caused by a tree branch, debris, or snow. That concludes out solar setup series. We hope it was useful to you. Please do feel free to ask questions or make comments. We can’t promise we’ll have the answers, but we’ll certainly try to find them.